The METAL DECK is back in blue! 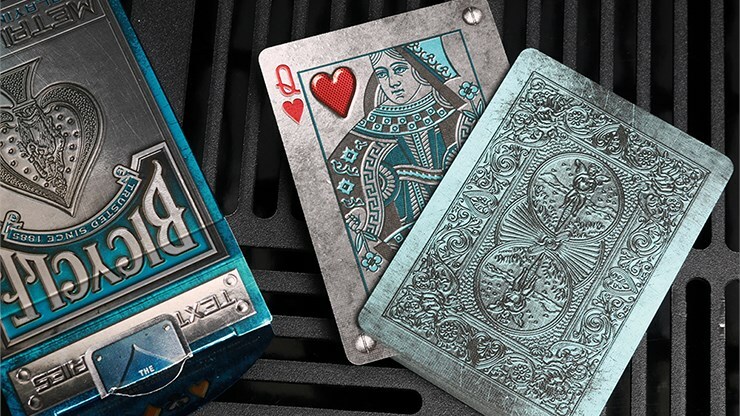 It's time to give your cards a heavy-metal upgrade! 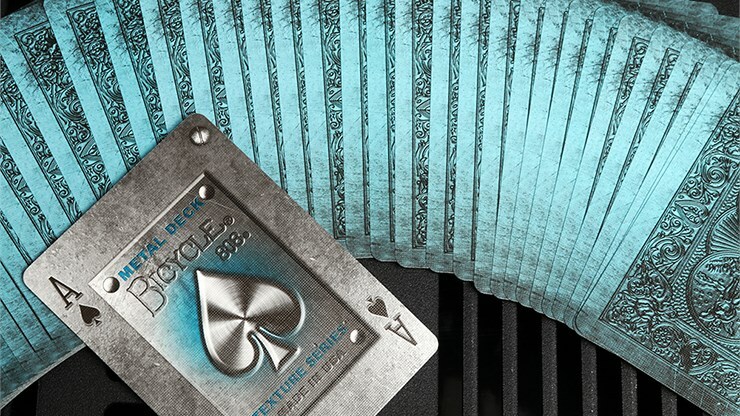 This redesigned Bicycle RIDER BACK deck is similar to the original metal deck, but now with a more aesthetically pleasing blue color on the backs and faces. And just wait until you see the looks it gets. Everyone one will be staring at this unique design, wanting to touch them to see if they are real metal or not! The tuck box has the same impressive look as the original, with the eye-catching silver foil stock and deep debossing, as well as an interior design. The deck also comes with a new custom Joker revelation, new Ace of Spades and new seal. So trade in your old deck for one sure to get noticed. Order your Blue Metal Deck today! Summary: Textured to look just like metal! 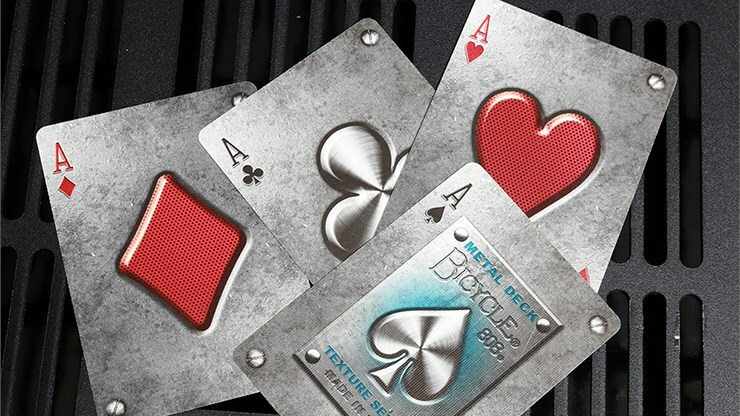 The original Bicycle Metal deck was produced by Max Playing Cards and Collectable Playing Cards in 2015 as the very first deck in their Bicycle Texture Series. 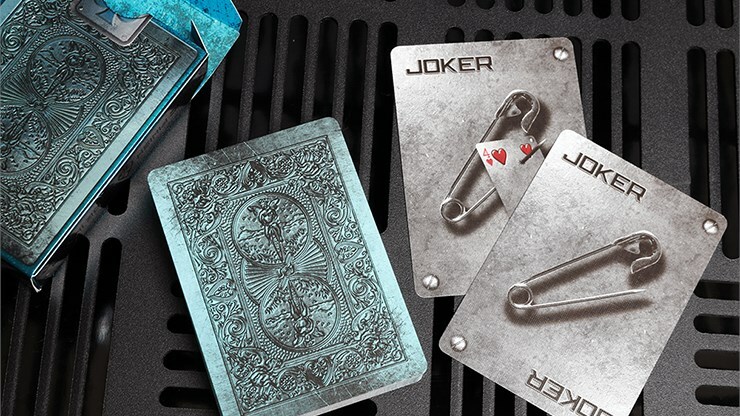 Its success was bigger than anticipated, and received high praise for its attention to detail, and how the cards actually had the appearance of slightly worn metal. It really looked superb! 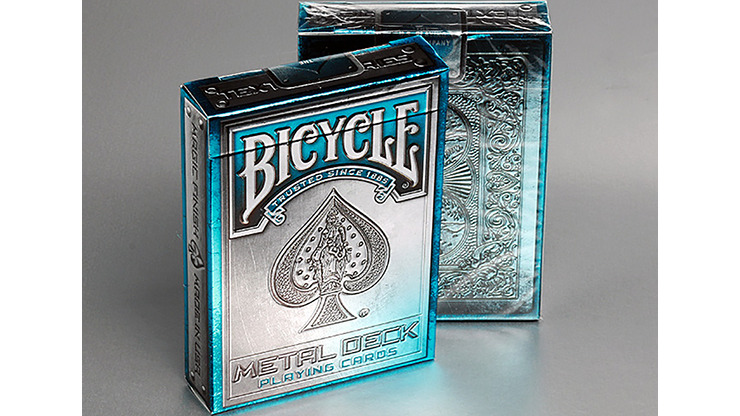 Given the huge success of the original, a second edition was produced two years after the original release, namely this Metal deck (Blue edition). The tuck box is made of stunning metallic foil, with embossing that gives both the feel and look of textured metal. It has all the bling you'd expect, including a custom seal, interior printing, and card reveal on the inner flap. It's like the original, but uses blue instead of red as the secondary colour for the colour accents on the card backs, Ace of Spades, and tuck box. 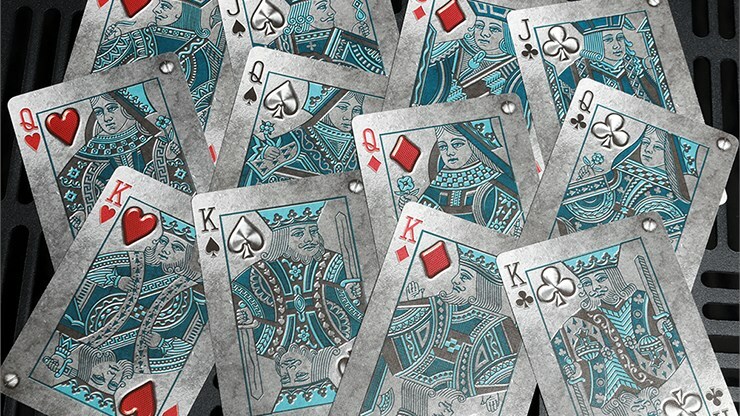 The blue tone used on the card backs arguably fits better with the colour of the court cards, making this deck even better than the first edition. Aside from the change in secondary colour, the overall artwork is unchanged, with the pips being highly textured, chrome being used for the black suits and carbon for the red. The precise shading really does give the impression of actual metal. And like the original deck, small touches of detail add extra points of interest, like the corner screws on the cards, which have a flip-motion feature when riffling through them in order.